I made my first modern quilt in 1987 while living in Tokyo. I had never met a quilter in the US or Japan and was just kind of doing my own thing. In 1999 Bill and I decided to see if we could bring modern quilt design mainstream. Although we have designed over 100 fabrics and written 5 books, it always felt as though we were still on the fringes of the quilting world. “We don’t have customers who would buy this,” is a phrase we’ve heard for many, many years from shop owners. Somehow it feels as though everything changed at Market in Kansas City. It was very interesting to talk with shop owners about their perception of what will sell now. Some already have a modern shopping clientele and were buying more aggressively. Others with more traditional shops came to our booth, looking confused and wanting help understanding “the whole modern thing.” “So what’s your definition of modern quilting?” they’d ask. Or “I don’t even know where to start” they’d say when trying to figure out what to buy to attract modern quilters. For us the feeling was two-fold. I really was excited to have an opportunity to explain to shop owners what we hear when we teach and lecture and what sells well for us. There was also the immense relief that maybe there’s some acceptance — or possibly even appreciation? — that we’re trying to offer a different way of thinking about and making quilts. I got back to Chicago on May 22 and I have been processing orders, signing contracts and answering phone calls and emails 12-15 hrs a day ever since (hence a blog post written at 11:45 on a Friday night). I haven’t touched a sewing machine. Certainly it’s a great problem to have but it’s so sudden after all of these years. I’ll tell you more details as I am able but we have a very exciting, if exhausting, year ahead. I wish that reality TV could have chronicled our business over the past 13 years for young people just starting out their careers. It’s the opposite of the Cinderella reality shows where you go from being a waitress one day to the chart-topping Kelly Clarkson 6 weeks later. Year by year, trying hard to blaze a new trail. We found success in the design world (there was that one awesome week when we had quilts in Oprah’s magazine, TIME magazine and the cover of Country Living) but the quilting world was a much harder nut to crack. We dealt with lots and lots and lots of rejection and more than a little envy but realized in the end that it’s about running your own race. I remember someone asking me in 2004 when Amy Butler had just begun to take off, “What can you learn from Amy Butler that would help your business?” Ouch! I responded honestly, “That we’re not Amy Butler. That we don’t have her skill set. We have our own and we just have to keep trying to find an audience for it.” A trusted shop owner who has known us since 2003 recently said, “You were too early.” So true. Our work is just starting to get the audience we always worked for. I wish it had been faster but I’ll take it. So this was the moment that I’ll always remember about Quilt Market. I wrote about this on Facebook but I know not all of you go there. So I’ll repeat it: Amy and David Butler stopped to admire some quilts in our booth. — I’ll pause while you gasp like I did. — I had met Amy in 2003 before she was a household name but everyone wants a piece of her now so I’ve tried not to “remember me?” her. I wasn’t sure what David would think of our Best of Both Worlds quilt made with his fabric but channeling my late mother-in-law (who said that you should always tell people when they’ve done something well) I thanked Amy and David for transforming the quilt world and for raising the bar for everyone at Market. It was a seriously frumpy show before they came along and showed people how to merchandize their work. She paved the way for a lot of us and I’ve always felt indebted to her for that. Amy thanked me and then very graciously told me that she had always found our work inspiring. Tears welled up in my eyes. She told us about a speech that we wrote that she heard 7 years ago that has stuck with her because she thought it was poetic and beautiful. I couldn’t speak. I just thought,” I wish Bill were here to hear this. I don’t ever want to forget this moment.” Kinda like Michael Jordan telling you, “You got game.” That conversation will be creative Red Bull for me for the rest of my career. Now if I had only had my wits about me enough to take my picture with her before she had to return to her booth. But David stayed another moment and we got this shot with my quilt and his totally cool business card-beer coaster in my hand. Gosh I needed that. Hi Weeks, congratulations too! Wishing one day, I will get to see your booth, your quilts up close since I am more of a fan, of you & Bill. Have a good weekend ! Weeks! Listen hear! Your work is amazing, and I am so glad I found your work. Your patterns are to me like high art that I can achieve. They are wonderful, fresh and zingy. Your work is creating it’s own space in the modern quilt world, and yes you were ahead of your time, but we are catching up with you. Your designs are more challenging than some of the other modern designs, and do require a skill set that takes some time to attain. 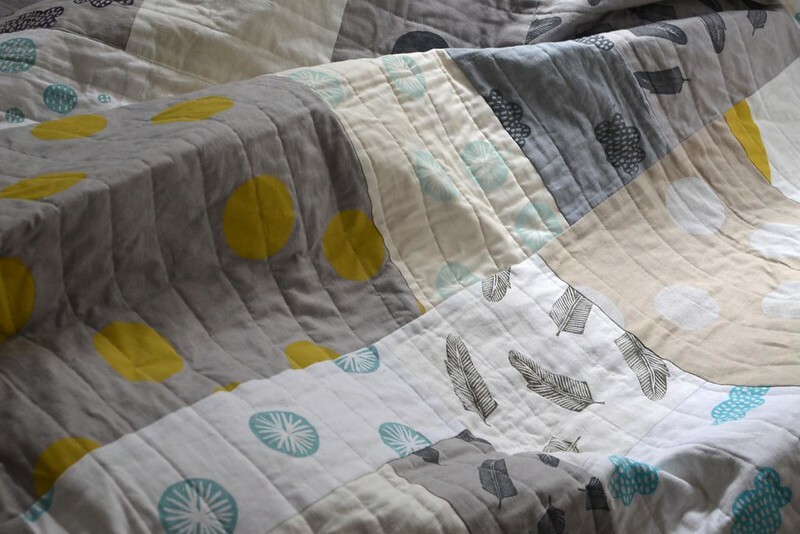 When I look at that quilt, and at your designs, I feel as though I am becoming an accomplished quilter. That is where your designing sits for me. Yes, my quilt will be used every day, but it was a challenge. I work in a challenging area of work,which often has little or no change, so the title of the quilt appealed to me. You are respected by all those who see your books, who make your quilts, and you have a growing audience. Maybe it is time for you to sit down, and look at where you want to direct your energies, and to decide on looking at others who can help with the stuff that takes you away from creating? Nicole Mallileu, a local designer in australia has just done this, check out her site for more information. I pay someone to clean my house so I can have time to do the things I love, and to spend with those I love. And remember, you do have a different skill set, a uniqueness and a strength that is all your own. And you have Bill and your daughter. I will stop now, I hope I have not offended anyone with my rant. Thanks for your perspective Lorraine. I’m glad that you find our work inspiring but the “hire someone to do the other work so you can design part” just hasn’t been financially possible for us because our following just hasn’t been big enough until now. Not enough people have understood and appreciated our work, bought our books, subscribed to our magazine or hired us to teach to make the scenario you’re describing possible. It just comes down to numbers and no matter how enthusiastic and wonderful our fans have been if there aren’t enough of them you can’t afford to hire out the order processing and kit packing. I’m hoping that’s about to change. Your quilts and your ethos remind me of Lucinda Williams- another under appreciated American. Lucinda will spend 5 years working on an album, and ditch it if it doesn’t meet her expectation of herself. Every time she comes to Australia her shows are sold out, but you don’t hear her on commercial radio. Also, your works put me in mind of Georgia O’Keefe, who used colour and form so beautifully, as you do. Your recent soft colour quilt reminded me of her work, as does the vibrancy and life in all your work. She is another who found success later than she deserved. I have just been interviewed by down under quilts and you and Bill were most certainly mentioned. I take your magazine to our guild meetings, and I will review them on our forum. Sadly, many of the other larger, more established guilds meet at times when I am working, otherwise I would do more. I find that the other reason I pay someone to clean is it takes me ten times as long because being tidy is just not in my skill set! I just cannot get my head around it anymore, I have an injury that affects my ability to focus on such tasks. Well, that’s my story, and I’m sticking to it. WOW,Lorraine really said many of the thoughts I have as well. Great post Weeks! Just…..such good news and congraulations. You are very appreciated out here. It’s wonderful that they took the time to tell you that. The fact that you’ve been out there, fighting the fight, gaining exposure for a different way of quilting has helped the whole modern quilt movement. Thank you! I’m sure that the modern quilt movement would not be where it is today without your work! Congratulations on the upcoming developments, they are well deserved! Weeks it was so great to meet you at the KCMQG/STLMQG Meet Up. What an event that was! Even better was listening to you speak at our May KCMQG meeting. To share a little of your process was so inspiring. My “Small World” quilt was so fun to make in honor of your visit. I hung it in my office so I could look at it each day. I can’t wait to see what the future holds for you and Bill……so exciting! I teared up reading this! I was so happy for you! Your work is so inspiring. You have no idea. There is not enough time to do all that you and the others drive me to try. I walk into some quilt shops and I just get nothing. It’s sad. Only a couple of shops really get it. Congratulations on your well deserved feeling on accomplishment!! I have been in awe of your work for as long as I have known of your quilting journey. Please take the good advice of a previous commenter and find others to do what you consider the “drudgery” be it business work, housework or whatever would compromise your time for creativity. That way we… (you and all of us) can reap the rewards of your skill and energy. I admire the work you and Bill do Weeks but I really love how you share yourselves with others so openly and with such heart. I’d been quilting for almost four years and was trying to find my own style when I came across The Modern Quilt Workshop. I’ll never forget my excitement at seeing the quilts you and Bill included in that book. They spoke to my soul and it said “YES” this is the kind of quilt I want to make! I wish my enthusiasm had made you rich, but the inspiration (then and now) has been priceless to me. Wishing you endless success! Yay!!!! I’m so glad the modern quilt movement is finally getting the attention it deserves. Modern quilting has inspired a new generation of quilters, many of whom would have never have walked into a traditional quilt shop…except to help their grandmothers. My dream is to live near you, Weeks…I’d apply to be one of your new employees. I find your designs very fresh! Congratulations on all this great news that some in the quilt world are catching up with you! It will be good to be in the front of the modern movement. As a long time follower and admirer and am so happy for you and glad that the quilting world is finally catching on. You and Bill have so much to offer. I can’t wait to see what the next year brings. Fantastic post. Congratulations on your continued success and for being trailblazers! I could see where the change to modern has taken several years. In some ways, the quilting community can be quite set in their ways. I live in a community of about 50,000. The quilt shop here is primarily traditional fabrics. About three years back, they hired a younger gal who worked very hard to bring some of the modern fabrics into the shop. I loved her choices. But the support wasn’t there and eventually she left the shop. Too bad. They missed out. I think I have more of a perspective now, I was listening to a radio show from New Zealand(our neighbor and where they filmed Lord Of The Rings) and they used a statistic that amazed me. One in ten American households has a quilter! That is ten per cent of households, no wonder you are finding your lack of financial success frustrating. That is a mighty big pie to miss out on. Phwew! All I can say Weeks, when those one in ten wake up to Modern Quilting and want some designs that are intricate, demanding and skills based, be ready darling!! congratulations on your fabulous time at market, it was well deserved! I am so happy you are getting the recognition you so richly deserve, finally. I am a longtime quilter (started in the 70’s) and I have finally started to “get” modern quilting in the last couple of years. You know how sometimes it takes our eyes awhile to get used to a new ‘something’, like a new color combination or pants length? Modern quilting was like that for me. I always liked the designs, but it took me some time to start liking the fabrics used in modern quilting…the solids and all that white. But now modern quilts look so fresh to me and I have made one or two quilts that I’d call modern. You have had a HUGE influence on quilters. Amy Butler has fabrics in a lot of places, but I see the influence of your quilt composition and fabric use as so much broader than that. You are truly pioneers of a movement. Weeks, I’ve always admired and followed your clean and sophisticated style. I can’t wait to see what the future holds for Modern Quilt Studio. I hope to meet you in Austin in February! The pre-modern era of quilting was before my time — I only really got into it in the last 4-5 years — but I’ve always loved your work. My mom is now interested in learning to quilt and I want to get her a book to start off with, and while it seems silly to give her a book I could lend, it also seems silly to give her anything other than ‘The Modern Quilt Workshop.’ Thank you for that book, and for your work! Kelley – you speak my mind! I simply love the work of Weeks and Bill. I have all their books and am now beginning to collect their fabrics. I have discovered Marcia Derse from this blog. They have opened up the world of quilting for me. I hope to visit their studio one day. Weeks, you and Bill are the reason I quilt. Both my Mom and Grandmother were traditional quilters, and while I liked it, it wasn’t ‘me’. I was looking through the library quilting section about 6 or 7 years ago, and came across your book. That was it, I was hooked! I have had trouble finding fabrics that fit my vision, so I am happy that more quilt stores are interested in diversifying. Keep doing what you are doing, there are those of us that have been fans of yours for years, and I know I look forward to whatever you come out with.